GB virus type C (GBV-C) viremia is associated with reduced CD4+ T cell expansion following IL-2 therapy and with a reduction in T cell activation in HIV-infected individuals. The mechanism(s) by which GBV-C might alter T cell activation or IL-2 signaling have not been studied. In this study, we assess IL-2 release, IL-2R expression, IL-2 signaling, and cell proliferation in tet-off Jurkat cells expressing the GBV-C envelope glycoprotein (E2) following activation through the TCR. TCR activation was induced by incubation in anti-CD3/CD28 Abs. IL-2 release was measured by ELISA, STAT5 phosphorylation was assessed by immunoblot, and IL-2Rα (CD25) expression and cell proliferation were determined by flow cytometry. IL-2 and IL-2Rα steady-state mRNA levels were measured by real-time PCR. GBV-C E2 expression significantly inhibited IL-2 release, CD25 expression, STAT5 phosphorylation, and cellular proliferation in Jurkat cells following activation through the TCR compared with control cell lines. Reducing E2 expression by doxycycline reversed the inhibitory effects observed in the E2-expressing cells. The N-terminal 219 aa of E2 was sufficient to inhibit IL-2 signaling. Addition of purified recombinant GBV-C E2 protein to primary human CD4+ and CD8+ T cells inhibited TCR activation-induced IL-2 release and upregulation of IL-2Rα expression. These data provide evidence that the GBV-C E2 protein may contribute to the block in CD4+ T cell expansion following IL-2 therapy in HIV-infected individuals. Furthermore, the effects of GBV-C on IL-2 and IL-2–signaling pathways may contribute to the reduction in chronic immune activation observed in GBV-C/HIV–coinfected individuals. GB virus C (GBV-C) is a human virus classified within the Flaviviridae that is not clearly associated with any disease (reviewed in Refs. 1–3). GBV-C infection frequently leads to persistent viremia and is highly prevalent, with ∼1–4% of U.S. blood donors infected at the time of donation (2, 4). Because of shared routes of transmission, the virus is highly prevalent among HIV-infected individuals (up to 42%) (1, 2, 5). Several studies, although not all, observed an association between persistent GBV-C infection and prolonged survival in HIV-infected individuals (6–15). GBV-C is a lymphotropic virus, and infection modulates several host factors involved in HIV infection, including expression of cytokines, chemokines, and cellular receptors (reviewed in Ref. 16). These alterations in host lymphocyte factors may limit HIV infection and contribute to a protective effect of GBV-C coinfection observed in HIV+ individuals. Chronic HIV infection is characterized by persistent immune activation that contributes to T cell depletion, altered cytokine expression, and loss of T cell function (reviewed in Refs. 17–19). IL-2 is a critical cytokine required for T cell activation, proliferation, and function (reviewed in Refs. 20, 21). However, IL-2 also induces the secretion of proinflammatory cytokines, such as IL-6, IL-1β, and TNF-α (22–24), and it is associated with increased levels of inflammatory markers, such as C-reactive protein and d-dimer, in the plasma of HIV-infected subjects, independent of HIV viral load (VL) (25). In addition, in vitro activation of PBMCs with IL-2 increases HIV production (26, 27). Thus, IL-2 promotes HIV replication and contributes to HIV-associated immune activation. Immune activation appears to be a better predictor of HIV disease progression than is plasma HIV VL (28, 29). In studies of HIV-infected people, GBV-C viremia is associated with lower cell surface expression of T cell-activation markers compared with GBV-C nonviremic controls, independent of HIV VL (30–32). GBV-C viremia is also associated with a significantly reduced CD4+ T cell expansion in HIV-infected subjects receiving i.v. IL-2 therapy compared with GBV-C nonviremic controls (33). Together, these findings suggest that GBV-C infection may alter T cell activation and IL-2–signaling pathways. In addition, GBV-C replication in PBMCs is significantly reduced following in vitro activation with IL-2 and PHA (34, 35), suggesting a potential bidirectional interaction between GBV-C and IL-2. Because IL-2 plays an important role in HIV infection and disease progression, the effects of GBV-C on IL-2–signaling pathways may contribute to the protective effect of GBV-C coinfection in HIV-infected individuals. Previous studies demonstrated that GBV-C envelope glycoprotein (E2) inhibits HIV replication when added to cells (2, 36, 37) or when expressed in a CD4+ Jurkat T cell line (38). In this study, we examined the role of the GBV-C E2 protein in the modulation of IL-2 production and IL-2–signaling pathways. The GBV-C E2 protein-coding sequence without the C-terminal transmembrane region (nt 1167–2161 based on GenBank AF 121950), E2 deletion mutants (N-terminal 219 aa [nt 1167–1824], and C-terminal 112 aa [nt 1824–2161]), as well as control sequences, were ligated into a modified pTRE2-Hyg plasmid (Clontech Laboratories, Mountain View, CA), as previously described (38). This plasmid generates a bicistronic message encoding the GBV-C E2 sequence, followed by the encephalomyocarditis virus internal ribosomal entry site that directs translation of GFP (39). Transcription of the bicistronic message is regulated by doxycycline, as described (38). Jurkat (tet-off) cell lines (Clontech Laboratories) were transfected (Nucleofector II; Lonza) with plasmids encoding GBV-C E2 proteins. Control cell lines were generated by transfecting Jurkat (tet-off) cells with an E2 plasmid containing a frameshift mutation to abrogate protein expression (frameshift control cell line [FS]) or the empty vector expressing GFP (vector control [VC]). Stable cell lines were generated after selection in hygromycin and neomycin (200 μg/ml), and GFP+ cells were bulk sorted using a Becton Dickinson FACSDiva (University of Iowa Flow Cytometry Facility). Expression of GBV-C E2 protein or E2 mutants was analyzed by immunoblot, and GFP expression was analyzed by flow cytometry (Becton Dickinson FACScan). All cell lines were maintained in RPMI 1640 supplemented with 10% FCS (heat inactivated), 2 mM l-glutamine, 100 IU/ml penicillin, and 100 μg/ml streptomycin with hygromycin and neomycin (200 μg/ml). Insert and control sequences were confirmed by sequencing plasmid DNA (University of Iowa DNA Core Facility). Recombinant GBV-C E2 protein fused to Fc at the C terminus was constructed by inserting the human IgG Fc coding sequence at nt 2161 of GBV-C E2 in the pSec vector (Invitrogen). CHO cells were transfected and selected on zeocin (400 μg/ml) and GFP expression. Following stable transfection, cells were adapted to serum-free media, as described (40). Fusion protein expressed in CHO cells was purified by protein G affinity chromatography and analyzed by SDS-PAGE and immunoblot analysis, as described (40, 41). Purified human IgG protein was used as a negative control for the E2–human Fc fusion protein. Jurkat cells (1 × 106 cells/ml) were stimulated with plate-bound anti-CD3 (5 μg/ml, OKT3 clone; eBioscience) and soluble CD28 (5 μg/ml, clone CD28.2; BD Biosciences). After obtaining written informed consent, PBMCs were isolated from blood from four healthy subjects using Ficoll-Hypaque density-gradient centrifugation. This protocol was approved by the University of Iowa Institutional Review Board. PBMCs were washed with PBS and incubated with purified GBV-C E2 protein (20 μg/ml) or purified human IgG (20 μg/ml; Sigma) for 48 h and stimulated with anti-CD3 (500 ng/ml) and soluble CD28 (500 ng/ml). Following 24 h of stimulation, cells were analyzed for measurement of cytokine and cellular receptor expression. To measure STAT5 phosphorylation, Jurkat cells were prepared as described (42). Briefly, cells were stimulated with 1 μg/ml anti-CD3 and soluble CD28 for 48 h, followed by 24 h of serum starvation, with or without doxycycline (1 μg/ml). Cells were washed and incubated with IL-2 (250 U/ml; Zeptometrix) for 15 min. Cell lysates were separated by PAGE using 10% gels, and the membrane was incubated with anti–phospho-STAT5 (pY694) or anti-STAT5 (both from BD Biosciences). Phosphorylation of STAT5 and total STAT5 expression were detected with Amersham ECL (GE Healthcare), using a Kodak Imager. IL-2 cytokine released into cell culture supernatant was quantified using a human IL-2 quantikine ELISA kit (R&D Systems, Minneapolis, MN), according to the manufacturer’s instructions. Total cellular RNA was extracted using an RNeasy Mini Kit (QIAGEN) following DNase treatment (RNase-Free DNase Set; QIAGEN). cDNA was generated using an RT2 First Strand cDNA Kit (SABiosciences); the relative expression of IL-2 and CD25 mRNA was determined using the RT2 qPCR primer assay for human IL-2 and human CD25 (SABiosciences) and normalized to 18SrRNA using an ABI 7500 Real Time PCR system. Jurkat cells or PBMCs were incubated with the following Abs from Becton Dickinson, per the manufacturer’s recommendation: CD3 (V450), CD4 (PE), CD8 (Alexa Fluor 700) and CD25 (allophycocyanin). Incubation was performed on ice for 1 h, and cells were subsequently washed three times with PBS. Data were acquired on a Becton Dickinson LSR II flow cytometer using single-stained CompBeads (BD Biosciences) for compensation. At least 10,000 total events were collected, and FlowJo software (Tree Star) was used for data analysis. Jurkat cells expressing GBV-C E2 protein or FS were stained with cell-proliferation dye (eFluor450; eBioscience) and stimulated with plate-bound anti-CD3 (1 μg/ml) and soluble CD28 (1 μg/ml); cell proliferation was measured by gating eFluor 450+ cells by flow cytometry. Statistics were performed using GraphPad software V4.0 (GraphPad Software). Comparisons between two groups were carried out using two-sided Student t tests; p values < 0.05 were considered statistically significant. Three previously described CD4+ Jurkat (tet-off) T cell lines expressing GBV-C E2 protein (331 aa), the N terminal 219 aa, and the coding region for the E2 protein with a frameshift to abolish protein expression (FS) were studied (38). In addition, a stable cell line expressing the E2 protein region from aa 220 to 331 was generated (Fig. 1A). All cell lines expressed GFP, as determined by flow cytometry (Fig. 1B), and cellular lysates reacted with anti-his Ab (QIAGEN) directed against C-terminal histidine (6xHis) tag in immunoblot analyses (Fig. 1C). Expression of GBV-C E2 RNA in Jurkat cells expressing the E2 frameshift construct was confirmed by RT-PCR and DNA sequencing, as described (39). E2-expressing Jurkat cells maintained in doxycycline (1 μg/ml) had reduced expression of E2 protein (Fig. 1D). GBV-C E2 proteins and controls. (A) Schematic diagram of GBV-C envelope protein E2 (nt 1167–2161; 331 aa), N-terminal deletion mutant (aa 1–219; nt 1167–1824), and C-terminal deletion mutant (aa 220–331; nt 1824–2161) and the 1–331 sequence with a frameshift inserted to abolish E2 expression (FS control). All of the recombinant proteins contained a C-terminal poly-histidine tag. Cell lines expressing the shaded constructs inhibited IL-2 release following TCR activation, whereas nonshaded constructs did not. (B) GFP expression was measured in the various cell lines. (C) Immunoblot analysis using anti-His Abs demonstrated recombinant GBV-C E2 protein expression in cell lines and deletion mutants (E2 1–219; E2 220–331). The FS negative control is shown. (D) GBV-C E2 protein expression was reduced >80% by maintaining Jurkat cells in doxycycline (Dox; 1 μg/ml) for 5 d.
Following TCR activation with anti-CD3/CD28, IL-2 release into culture supernatants was significantly lower in Jurkat cells expressing GBV-C E2 protein compared with either the VC or the FS control (Fig. 2A). 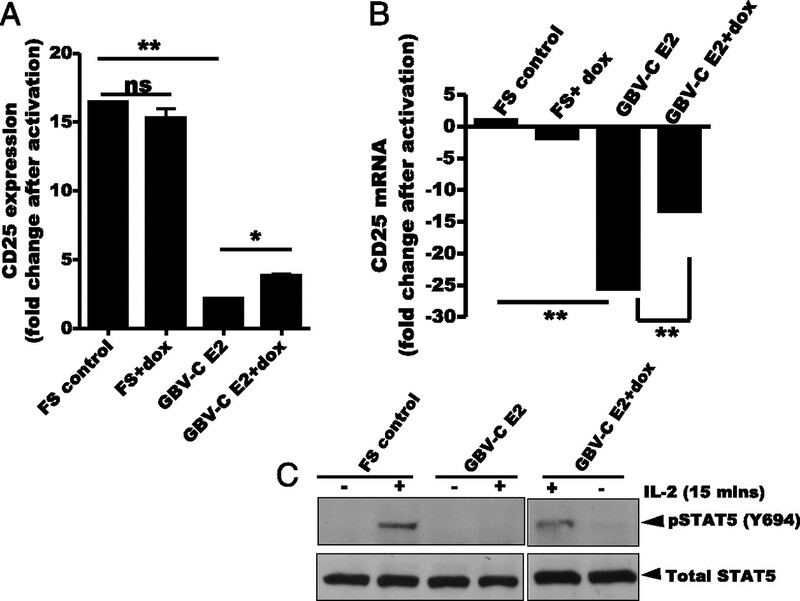 The FS control confirms that IL-2 inhibition is due to GBV-C E2 protein expression and not the effects of GBV-C E2 RNA (Fig. 2A). Examination of deletion mutants demonstrated that the N-terminal 219 aa of E2 were required to inhibit IL-2 release following TCR stimulation, whereas the C- terminal region of E2 (aa 220–331) was not (Fig. 2A). Jurkat cells expressing GBV-C E2 protein had significantly lower steady-state levels of IL-2 mRNA following activation compared with FS and VC control cells (Fig. 2B). Reduction of GBV-C E2 protein expression by maintaining cells in doxycycline (1 μg/ml) reversed the block in steady-state IL-2 mRNA levels following TCR activation (Fig. 2B). Of note, no differences in 18S mRNA levels were observed between any of the Jurkat cell lines studied. GBV-C E2 protein inhibits TCR-induced IL-2. (A) Following TCR activation with anti-CD3/CD28, IL-2 secretion was measured in Jurkat cells expressing GBV-C E2 protein (1–331), the C-terminal (1–219) and N-terminal (220–331) E2 deletions, the E2 coding region with a FS, or the VC. IL-2 release was significantly reduced in GBV-C E2- and E2 (1–219)-expressing Jurkat cells. (B) Jurkat cell IL-2 mRNA levels were measured in the various cell lines following TCR activation. Fold increase in IL-2 production was calculated by measuring IL-2 in the culture supernatant before and after activation. IL-2 mRNA levels were measured after activation and normalized to 18S rRNA levels. Each experiment was performed in triplicate using three independent cultures and repeated at least three times on different days with consistent results. *p < 0.05, **p < 0.01. ns, not significant (p > 0.05). Surface expression of the α-chain of IL-2R (IL-2Rα; CD25) is increased by activation of T cells (reviewed in Refs. 43, 44). Following upregulation, CD25 interacts with IL-2Rβ (CD122) and IL-2γ (CD132) receptors to form the high-affinity IL-2R that binds IL-2 and initiates IL-2 signaling (reviewed in Refs. 43, 44). In studies of HIV-infected people, GBV-C viremia is associated with lower CD25 expression on T cells and a reduced response to IL-2 therapy (30, 33). Consequently, we examined the effect of GBV-C E2 protein expression on Jurkat cell CD25 expression. CD25 expression was significantly reduced in cells expressing GBV-C E2 compared with the FS control following TCR activation (average fold increase in CD25 expression, 16.4 versus 2.16; p < 0.001), and this was also partially reversed by growing the E2-expressing cells in doxycycline (3.7-fold, p < 0.01) (Fig. 3A). CD25 mRNA steady-state levels increase following TCR activation, and this upregulation was also blocked in cells expressing the GBV-C E2 protein (Fig. 3B). This interference in the upregulation of CD25 steady-state mRNA levels was also partially reversed by maintaining the cells in doxycycline to reduce GBV-C E2 expression (Fig. 3B). Maintaining Jurkat cells in doxycycline did not affect cell viability, as previously described (Fig. 3A, 3B) (38). 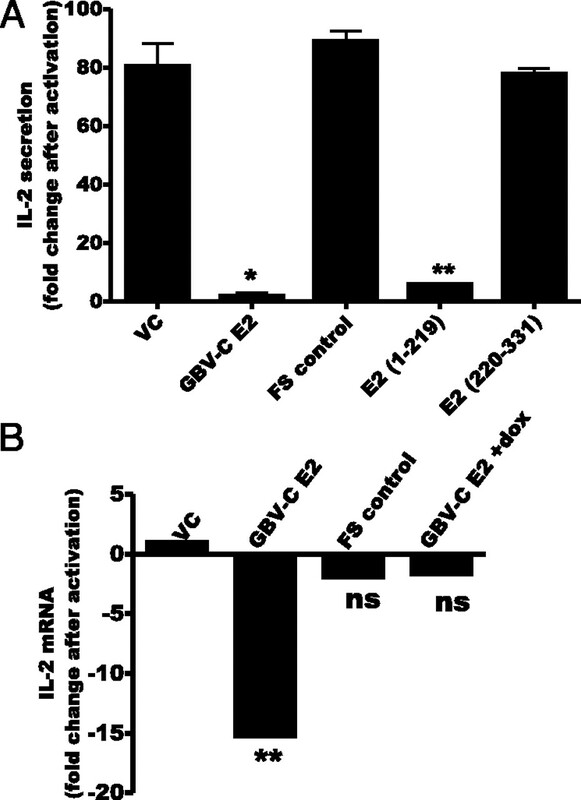 GBV-C E2 protein reduces IL-2Rα expression and STAT5 phosphorylation. (A) Cell surface expression of the IL-2α receptor (CD25) on Jurkat cells expressing GBV-C E2 (1–331) or the FS following TCR activation (anti-CD3/CD28) was measured by flow cytometry. The fold increase in CD25 expression was calculated by measuring mean fluorescence intensity before and after stimulation. (B) CD25 mRNA levels in Jurkat cell lines following TCR activation. GBV-C E2 and FS cells were maintained with or without doxycycline (dox; 1 μg/ml) for 5 d. (C) Total STAT5 and p-STAT5 expression following incubation with IL-2 (see Materials and Methods) in FS and E2-expressing Jurkat cells maintained with or without doxycycline (dox) for 5 d. *p < 0.01, **p < 0.001. Because CD25 expression is essential for IL-2 signaling, we further investigated the effect of GBV-C E2 protein expression on downstream IL-2–signaling pathways. Phosphorylation of STAT5 is rapidly detected after IL-2 interacts with IL-2R and is critical for IL-2 signaling (45). Following stimulation with IL-2, STAT5 phosphorylation was inhibited in GBV-C E2-expressing cells but not in FS control cells or GBV-C E2-expressing cells grown in doxycycline (Fig. 3C). In the absence of IL-2, addition of doxycycline to E2-expressing Jurkat cells did not induce STAT5 phosphorylation, indicating that doxycycline alone does not induce activation or IL-2 signaling. Total STAT5 protein expression was not altered by GBV-C E2 protein expression (Fig. 3C). Together, these data indicate that GBV-C E2 protein expression inhibits CD25 expression and IL-2–induced phosphorylation of STAT5. To determine whether the effect of GBV-C E2 expression on IL-2 release, CD25 expression, and STAT5 phosphorylation affected T cell proliferation, Jurkat cells expressing GBV-C E2 or FS were assessed by flow cytometry. Jurkat cells expressing GBV-C E2 or the FS control were labeled with the proliferation dye eFluor 450 (Day 0, Fig. 4A). Following TCR stimulation with anti-CD3/CD28, the Jurkat cells expressing GBV-C E2 protein demonstrated less proliferation than did the FS control (Day 5, Fig. 4A). This difference in proliferation between E2-expressing Jurkat cells and the FS control Jurkat cells was not seen when the cells were cultured without TCR activation (data not shown). The proliferation of these cell lines over 5 d following anti-CD3/CD28 stimulation is shown in Fig. 4B. 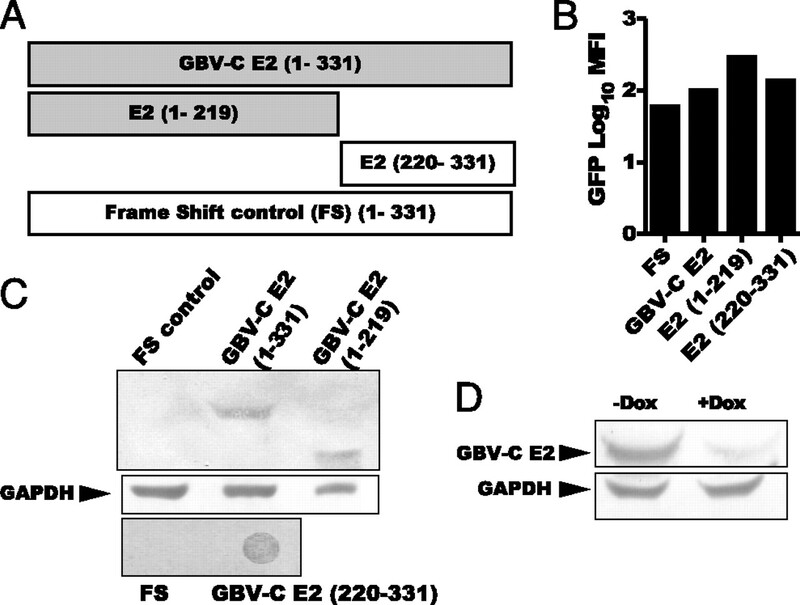 GBV-C E2 protein expression inhibits cell proliferation. (A) Proliferation of Jurkat cells expressing GBV-C E2 (1–331) or the FS was measured at baseline (Day 0) and following 5 d of activation with anti-CD3/CD28 by flow cytometry (eFluor 450). Propidium iodide staining was used to exclude dead cells. (B) Cell proliferation was quantified on days 3–5. The data represent the average of three independent cultures. *p < 0.05. To determine whether the addition of E2 to cells altered activation following TCR engagement, IL-2 release was measured in PBMCs incubated with highly purified recombinant GBV-C E2-Fc fusion protein (Fig. 5A) or human IgG control protein. IL-2 production was significantly lower in PBMCs from healthy donors (n = 4) incubated with GBV-C E2 protein (20 μg/ml) compared with cells incubated with human IgG (20 μg/ml; p = 0.008, Fig. 5B). Similarly, and consistent with the findings observed in the Jurkat cells expressing E2 protein, the addition of E2-Fc to primary CD4+ and CD8+ T cells obtained from the four healthy donors significantly blocked CD25 upregulation following anti-CD3/CD28 stimulation compared with cells incubated with IgG (20 μg/ml; p < 0.001, Fig. 5C). GBV-C E2 protein inhibits IL-2 secretion and IL-2Rα (CD25) expression in primary human T cells. (A) SDS-PAGE and immunoblot analysis of purified recombinant GBV-C E2 protein fused to human IgG Fc (E2-Fc). Bands in the gel represent monomeric (60 kDa), dimeric (120 kDa), and trimeric (180 kDa) forms of recombinant E2-Fc protein. IL-2 release from primary human PBMCs (B) and CD25 expression on CD4+ and CD8+ T cells (C) following activation with anti-CD3/CD28 Abs in media containing recombinant E2 (20 μg/ml) or human IgG control (20 μg/ml). Data represent average results obtained using PBMCs from four healthy subjects. IL-2 secretion by PBMCs incubated with GBV-C E2-Fc recombinant protein was normalized to IL-2 produced by control PBMCs incubated with the same concentration of human IgG. Persistent immune activation and immune dysfunction are characteristic features of chronic HIV infection that contribute to HIV-associated immunodeficiency (reviewed in Refs. 17, 19). Previous studies suggested a potential interaction between GBV-C and IL-2 in vitro and in vivo (33, 35, 46). IL-2 is a pleiotropic cytokine essential for normal T cell function; however, IL-2 also promotes HIV replication and activation-induced cell death of T cells (26, 47, 48). A recent study found an association between GBV-C viremia and reduced T cell activation-induced cell death, further suggesting that GBV-C viremia may reduce activation and alter the IL-2 response (35). In this study, we show that GBV-C E2 expression significantly inhibited IL-2 production and significantly blocked the upregulation of steady-state IL-2 mRNA levels following TCR engagement (Fig. 2). The region within the E2 protein required to alter IL-2 expression resided in the N-terminal 219 aa, because the expression of aa 220–331 of the GBV-C E2 protein did not affect IL-2 (Fig. 2C). Studies are underway to further characterize the precise domain within GBV-C E2 required to alter IL-2 expression. Clinical studies suggested interactions between GBV-C and T cell activation and proliferation. Specifically, HIV+ subjects with GBV-C coinfection had significantly reduced CD4+ T cell expansion following i.v. IL-2 therapy compared with subjects without GBV-C infection (33). Subjects without GBV-C infection had a significant increase in CD4+ T cell count after IL-2 therapy, whereas those with GBV-C did not (33). In addition, PBMC proliferation ex vitro was reduced in GBV-C viremic subjects following activation with IL-2 compared with PBMCs from subjects without GBV-C infection (35). Furthermore, GBV-C and HIV-coinfected subjects had reduced CD25 expression on CD4+ and CD8+ T cells compared with HIV monoinfected subjects (30). In this study, either the expression of the GBV-C E2 protein in Jurkat cells or the addition of recombinant E2 protein to primary CD4+ and CD8+ T cells reduced the expression of CD25 following TCR engagement compared with control cells (Figs. 3A, 5C). E2 protein expression was required for these effects, because cells expressing the GBV-C RNA region with a frameshift to prevent E2 expression and reducing E2 expression by maintaining cells in doxycycline reversed the inhibition of CD25 expression (Fig. 3A). Because GBV-C E2 expression is likely to be higher in stably transfected Jurkat cells than that produced during natural infection, the effect of E2 on IL-2 release and IL-2 signaling may be less potent in vivo. However, as noted, GBV-C coinfection with HIV is associated with a significant block in CD4 cell proliferation following the administration of rIL-2 (33). The in vitro data demonstrating that E2 expression inhibits IL-2 release, CD25 (IL-2Rα) expression, IL-2 signaling (measured by STAT5 phosphorylation), and cellular proliferation following TCR activation provides evidence supporting a causal role of GBV-C for the apparent interaction observed in the clinical study (33). Reducing GBV-C E2 expression by maintaining the cells in doxycycline reduced the extent of IL-2–signaling reduction. The fact that GBV-C E2-expressing cells still inhibited IL-2 after incubation in doxycycline suggests that low levels of E2 are sufficient to have a measurable effect on TCR-mediated signaling. GBV-C E2 protein also inhibited the upregulation of IL-2 and CD25 steady-state mRNA levels following TCR activation, contributing to the observed reduction in cellular proliferation (Fig. 4). Although reducing cellular proliferation also leads to reduced IL-2 and IL-2R expression, the effect of E2 protein specifically blocked TCR signaling, because both IL-2 production and CD25 expression were blocked within 24 h, prior to significant cellular proliferation. Finally, exposure of primary human CD4+ and CD8+ T cells to recombinant GBV-C E2 protein recapitulated the IL-2 and CD25 findings observed in Jurkat cells expressing E2 protein (Fig. 5B, 5C), suggesting that GBV-C particles containing E2 protein may influence TCR signaling in bystander cells. GBV-C infection is characterized by high levels of replication in HIV-infected people; on average, there are 5.45 × 107 genome equivalents of GBV-C/ml serum (35). If there are 180 copies of GBV-C envelope glycoproteins/virion as there are for other flaviviruses (reviewed in Ref. 2), ∼1 × 1010 copies of E2 are present in each milliliter of plasma. Furthermore, virus is produced by B and T lymphocytes (34); thus, E2 production predominantly occurs in lymphoid tissue. Therefore, even modest effects of GBV-C E2 protein on IL-2 homeostasis and T cell activation may result in global alteration of T cell function. 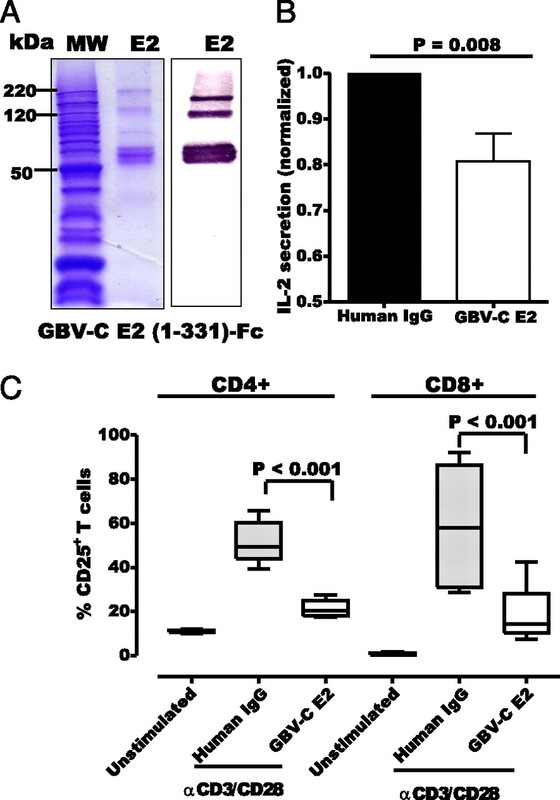 Because GBV-C is not associated with any known human disease, the association between GBV-C and reduced T cell activation and response to therapeutic IL-2 administration, although measurable, is not potent enough to lead to immunodeficiency. However, for immune-mediated disease, these effects may be beneficial; this may relate to the improved survival observed in many, although not all, studies of GBV-C infection in HIV-infected cohorts (6–12). In conclusion, these data provide in vitro evidence to support a causal role for the effect of GBV-C viremia on T cell activation and IL-2–mediated proliferation observed in epidemiological studies (30, 33). The effects on T cell activation and proliferation are mediated, at least in part, by the N-terminal 219 aa of the GBV-C envelope glycoprotein E2 in vitro. A previous study found that aa 276–292 of GBV-C E2 protein are sufficient to inhibit HIV replication at the entry step (38). Because GBV-C E2 protein containing this region did not interfere with activation or IL-2 signaling, it is clear that different E2 regions are involved in the interaction between HIV inhibition and the modulation of T cell activation and proliferation. Furthermore, the effects of GBV-C E2 protein on IL-2–signaling pathways may contribute to the reduction in HIV-associated immune activation observed in GBV-C/HIV–coinfected individuals. Given the pleiotropic effects of IL-2 on the immune system, studies on the effects of GBV-C infection on other immune cell functions are warranted. J.X., J.H.M, and J.T.S. have patents related to the use of GBV-C as potential therapy for HIV. We thank our volunteer blood donors for participating in these studies. We also thank Dr. Alan Landay (Rush University, Chicago, IL) for helpful discussions and advice. This work was supported by Merit Review grants from the Department of Veterans Affairs (to J.T.S. and J.X.) and by Grant R01 AI-58740 from the National Institute of Allergy and Infectious Diseases (to J.T.S.).
. 2011. The GB viruses: a review and proposed classification of GBV-A, GBV-C (HGV), and GBV-D in genus Pegivirus within the family Flaviviridae. J. Gen. Virol. 92: 233–246.
. 2009. GB virus type C interactions with HIV: the role of envelope glycoproteins. J. Viral Hepat. 16: 757–768. 2003. GB virus type C/Hepatitis G virus. Semin. Liver Dis. 23: 137–148.
. 2004. GB virus type C: a beneficial infection? J. Clin. Microbiol. 42: 3915–3919.
. 2000. High prevalence of GB virus C/hepatitis G virus RNA and antibodies in patients infected with human immunodeficiency virus type 1. Eur. J. Clin. Microbiol. Infect. Dis. 19: 721–724.
. 2004. Persistent GB virus C infection and survival in HIV-infected men. N. Engl. J. Med. 350: 981–990.
. 2003. Slower progression of HIV-1 infection in persons with GB virus C co-infection correlates with an intact T-helper 1 cytokine profile. Ann. Intern. Med. 139: 26–30.
. 2001. Effect of coinfection with GB virus C on survival among patients with HIV infection. N. Engl. J. Med. 345: 707–714.
. 2001. Infection with GB virus C and reduced mortality among HIV-infected patients. N. Engl. J. Med. 345: 715–724.
. 2000. Effect of hepatitis G virus infection on progression of HIV infection in patients with hemophilia. Multicenter Hemophilia Cohort Study. Ann. Intern. Med. 132: 959–963.
. 1999. GBV-C/hepatitis G virus (HGV) RNA load in immunodeficient individuals and in immunocompetent individuals. J. Med. Virol. 59: 32–37.
. 1998. Effect of GB virus C/hepatitis G virus coinfection on the course of HIV infection in hemophilia patients in Japan. J. Acquir. Immune Defic. Syndr. Hum. Retrovirol. 17: 209–213.
. 1998. GB virus C/hepatitis G virus infection: a favorable prognostic factor in human immunodeficiency virus-infected patients? J. Infect. Dis. 177: 1723–1726.
. 2004. GB virus C during the natural course of HIV-1 infection: viremia at diagnosis does not predict mortality. AIDS 18: 877–886.
. 2005. GB virus C coinfection and HIV-1 disease progression: The Amsterdam Cohort Study. J. Infect. Dis. 191: 678–685.
. 2012. GB virus C: the good boy virus? Trends Microbiol. 20: 124–130. 2009. Immunotherapies in HIV-1 infection. Curr. Opin. HIV AIDS 4: 188–193.
. 2009. Interleukin-2 therapy in patients with HIV infection. N. Engl. J. Med. 361: 1548–1559.
. 2008. Immune activation and AIDS pathogenesis. AIDS 22: 439–446.
. 2010. Role of interleukin-2 in patients with HIV infection. Drugs 70: 1115–1130. 2002. T-cell activation through the antigen receptor. Part 1: signaling components, signaling pathways, and signal integration at the T-cell antigen receptor synapse. J. Allergy Clin. Immunol. 109: 758–770.
. 2002. Tumor necrosis factor alpha, interleukin 2, and soluble interleukin 2 receptor levels in human immunodeficiency virus type 1-infected individuals receiving intermittent cycles of interleukin 2. AIDS Res. Hum. Retroviruses 18: 491–499.
. 2001. CD4 T cell expansions are associated with increased apoptosis rates of T lymphocytes during IL-2 cycles in HIV infected patients. AIDS 15: 1765–1775.
. 1993. Human interleukin 2 analogues that preferentially bind the intermediate-affinity interleukin 2 receptor lead to reduced secondary cytokine secretion: implications for the use of these interleukin 2 analogues in cancer immunotherapy. Cancer Res. 53: 2597–2602.
. 2009. Interleukin-2 cycling causes transient increases in high-sensitivity C-reactive protein and D-dimer that are not associated with plasma HIV-RNA levels. AIDS 23: 2015–2019.
. 1995. HIV replication in IL-2-stimulated peripheral blood mononuclear cells is driven in an autocrine/paracrine manner by endogenous cytokines. J. Immunol. 154: 2448–2459.
. 1976. Selective in vitro growth of T lymphocytes from normal human bone marrows. Science 193: 1007–1008.
. 2003. Persistent immune activation in HIV-1 infection is associated with progression to AIDS. AIDS 17: 1881–1888.
. 1999. Shorter survival in advanced human immunodeficiency virus type 1 infection is more closely associated with T lymphocyte activation than with plasma virus burden or virus chemokine coreceptor usage. J. Infect. Dis. 179: 859–870.
. 2009. GB virus type C infection modulates T-cell activation independently of HIV-1 viral load. AIDS 23: 2277–2287.
. 2010. GB virus C coinfection in advanced HIV type-1 disease is associated with low CCR5 and CXCR4 surface expression on CD4(+) T-cells. Antivir. Ther. (Lond.) 15: 745–752.
. 2003. Regulation of CC chemokine receptor 5 in hepatitis G virus infection. AIDS 17: 1457–1462.
. 2009. GBV-C viremia is associated with reduced CD4 expansion in HIV-infected people receiving HAART and interleukin-2 therapy. AIDS 23: 605–610.
. 2006. GB virus C replicates in primary T and B lymphocytes. J. Infect. Dis. 193: 451–454.
. 2012. GB virus C infection is associated with a reduced rate of reactivation of latent HIV and protection against activation-induced T cell death. Antivir. Ther. In press.
. 2011. Peptides derived from a distinct region of GB virus C glycoprotein E2 mediate strain-specific HIV-1 entry inhibition. J. Virol. 85: 7037–7047.
. 2007. HIV entry inhibition by the envelope 2 glycoprotein of GB virus C. AIDS 21: 645–647.
. 2012. Characterization of a peptide domain within the GB virus C envelope glycoprotein (E2) that inhibits HIV replication. Virology 430: 53–62.
. 2006. An 85-aa segment of the GB virus type C NS5A phosphoprotein inhibits HIV-1 replication in CD4+ Jurkat T cells. Proc. Natl. Acad. Sci. USA 103: 15570–15575.
. 2006. Characterization of an immunodominant antigenic site on GB virus C glycoprotein E2 that is involved in cell binding. J. Virol. 80: 12131–12140.
. 2010. GB virus type C envelope protein E2 elicits antibodies that react with a cellular antigen on HIV-1 particles and neutralize diverse HIV-1 isolates. J. Immunol. 185: 4496–4505.
. 2009. CCR5 expression levels influence NFAT translocation, IL-2 production, and subsequent signaling events during T lymphocyte activation. J. Immunol. 182: 171–182.
. 2011. T-cell tolerance and the multi-functional role of IL-2R signaling in T-regulatory cells. Immunol. Rev. 241: 63–76.
. 2006. Both integrated and differential regulation of components of the IL-2/IL-2 receptor system. Cytokine Growth Factor Rev. 17: 349–366.
. 1997. Signaling from the IL-2 receptor to the nucleus. Cytokine Growth Factor Rev. 8: 313–332.
. 2003. Clinical isolates of GB virus type C vary in their ability to persist and replicate in peripheral blood mononuclear cell cultures. Virology 316: 191–201.
. 1999. The role of the common cytokine receptor gamma-chain in regulating IL-2-dependent, activation-induced CD8+ T cell death. J. Immunol. 163: 3131–3137. 1991. Interleukin-2 programs mouse alpha beta T lymphocytes for apoptosis. Nature 353: 858–861.